The annual report on fatal workplace injuries across the US was recently released by the federal Bureau of Labor Statistics (BLS). 2016 saw a startling rise in the number of on-the-job deaths, and surprising new trends in the ways in which workers are getting hurt on the job. Read on to learn more, and contact an Ohio workers’ compensation lawyer after you’re hurt at work. According to the report released by the BLS, 5,190 American workers died while at work in 2016. This number is 7% higher than the 2015 total of 4,836. 2016 was also the third consecutive year where fatal injuries on the job rose, and the first year since 2008 when more than 5,000 people were fatally injured in the workplace. The rate of fatal injury also rose from 3.4 to 3.6 deaths per 100,000 full-time workers. This is the highest that the fatal injury rate has been since 2010. Yet again, the most common cause of fatal injuries at work in 2016 was transportation incidents, which took the lives of 2,083 workers and accounted for 40% of all deaths on the job. Specifically, roadway incidents accounted for 1,252 deaths, or one in every four workplace deaths. The second-leading cause of death, however, became violence or other injuries caused by persons or animals, which took 866 lives. The number of workplace homicides increased to 500, an increase of 83 over 2015’s total, and the highest number of on-the-job homicides since 2010. Another 291 workers committed suicide at work, which is the largest-recorded number of on-the-job suicides since 1992, when this data was first reported. Since 2012, the number of fatal overdoses on the job has increased by at least 25% each year. This year, the number of fatal overdoses linked to nonmedicinal drug or alcohol use rose by 32%, killing 217 people while at work. 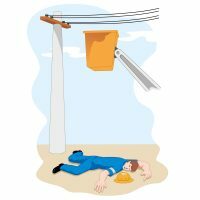 Other leading causes of on-the-job deaths included slips, trips, and falls, which collectively resulted in 849 deaths. The number of deaths caused by falls has risen by 25% since 2011. Workers and families of workers who are hurt on the job may have a right to compensation for medical expenses or wrongful death, and should seek the advice of an experienced workers’ compensation attorney to learn about their rights after an accident. If you’ve been hurt at work in Ohio, get the benefits and compensation you deserve by contacting a knowledgeable and seasoned Columbus workers’ compensation lawyer at the Miller Law Practice for a free consultation at 614-591-6822.